ActiveX is Microsoft technology used for running games and other software programs on the Internet. Games that require ActiveX will only play using Microsoft Internet Explorer on a Windows computer. To play an online game that requires ActiveX, open the Internet Explorer web browser from your Windows desktop and visit our Online Games section. If you don't have Internet Explorer installed, visit the Microsoft Internet Explorer page to download the latest version. 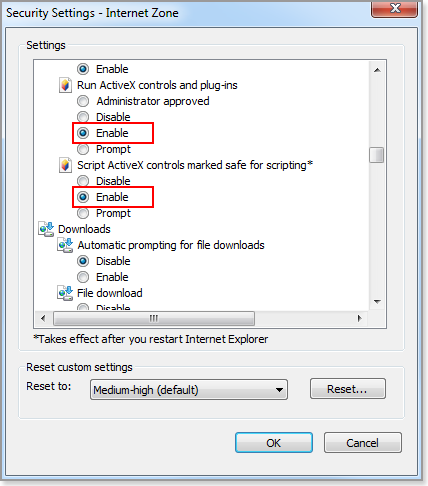 Need help enabling ActiveX in Internet Explorer? If you're still unable to play your game after switching to the Internet Explorer browser, follow the steps below to enable ActiveX from the Tools menu. From the Tools menu near the top of your browser window, select Internet Options. Click the Security tab and then select the Internet zone icon. Click the Custom level button to open the Security Settings - Internet Zone box. Scroll down to the Internet ActiveX Controls and Plugins section. Enable both Run ActiveX Controls and Plugins and Script ActiveX Controls Marked Safe for Scripting. Click OK to save your settings and again to close the Internet Options box. Restart Internet Explorer and start playing your game!